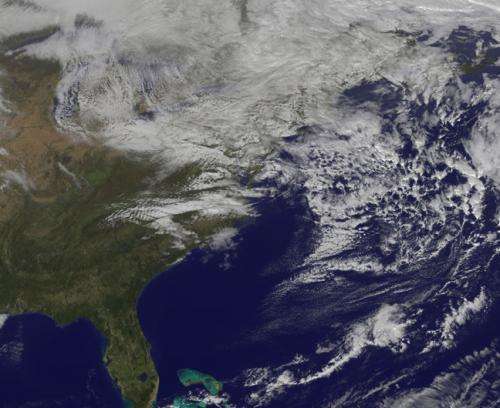 Satellite imagery from Nov. 2 showed that Sandy's remnant clouds continue to linger over Canada and the northeastern U.S. The National Weather Service map for Nov. 2, 2012 showed two areas of low pressure over eastern Canada, near Quebec. That's where the remnants of Sandy are located and the storm's massive cloud cover continues to linger over a large area. That low pressure area is associated with Sandy's remnants. A visible image from NOAA's GOES-13 satellite at 1:31 p.m. EDT on Nov. 2, 2012 showed the remnant clouds from Sandy still linger over the Great Lakes east to New England. In Canada, Sandy's clouds stretch from Newfoundland and Labrador west over Quebec, Ottawa and Toronto. The GOES image was created by NASA's GOES Project at the NASA Goddard Space Flight Center, Greenbelt, Md. By Monday, Nov. 6, the National Weather Service map projects that the low pressure area associated with Sandy's remnants will be offshore.